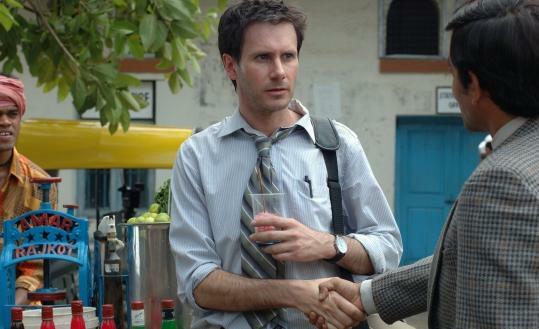 "Outsourced" is a sweetly acted and neatly executed social comedy. An American named Todd Anderson (Josh Hamilton) works at a company that sells American kitsch (ceramic bald eagles, hot dog toasters, stuff like that). His boss fires Todd's co-workers and ships him to India to train the men and women who'll work the phones at a call center for considerably less money ($11,000 a year). The director, John Jeffcoat, and his co-writer, George Wing, come up with the expected culture chafing - Todd's name is pronounced "Toad," he's told it's offensive to dine with his left hand, and something he eats doesn't sit right with him. But these encounters aren't fraught with resentments, political ill will, or anthropology. The Indians are regular folks who like being employed, and if they're going to become better enunciators of English by, say, reciting dialogue from American movies, Todd had better learn a thing or two about the country he's living in: He tries to dance like the Bollywood superstar Salman Khan. The call center's management trainee, Purohit (Asif Basra), is also his host. He's got dreams, charisma, intellectual curiosities, and a woman he's been dying to marry. His bond with Todd blooms into real buddyship. Todd also gets close to Asha (Ayesha Dharker), a phone operator with alluringly prominent facial features. Jeffcoat handles the ostensible cultural differences gingerly. The movie's approach to globalism is to play everything small and keep everybody human. Todd's Americanness never gets ugly. He's simply dislocated. And Asha is a modern woman with her own cultural obligations. In its patience and affection, "Outsourced" is a movie Bill Forsyth might have tried - well, with "Local Hero," he did. Jeffcoat's movie isn't as well articulated and its characters aren't as vivid. But it works on its own terms. Todd, for instance, really is touched by this trip. What dawns on you as the sun shines on everybody in "Outsourced" is that things probably aren't so chummy back in the States, but the news in India doesn't stay good for long. Jeffcoat digs in his heels at capitalism's cruel bottom line. But what he shows us is nicely observed. This is the movie of a gentle man and an optimist. The bad news, at least in India, has a slightly silver lining. Wesley Morris can be reached at wmorris@globe.com. For more on movies, go to boston.com/ae/ movies/blog.